She studied singing at the Berlin conservatoire and later under the famous pedagogue Selma Nicklass-Kempner. In 1900 she made her debut at the Stadttheater of Hamburg and remained active member of this opera house in the 1901-06 seasons. From 1906 to 1909 she sang at the Stadttheater in Darmstadt, in the 1909-1911 seasons at the Opernhaus of Düsseldorf and from 1911 to 1913 at the Kurfürstenoper in Berlin. Since then she lived in Hamburg and made guest appearances. At the Bayreuth festival she worked in 1906 and in the 1908-1909 seasons as Ortlinde in "Walküre", Soloblume in ‘’Parsifal’’, in 1906 also as 2. Knappe in ‘’Parsifal’’. 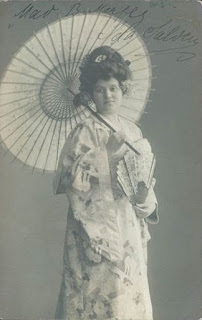 In 1906 and 1907 she guested at the Hoftheater of Mannheim, in 1908 at Hoftheater in Karlsruhe, in 1909 she sang at the Oper of Frankfurt a. M., in 1910 in Amsterdam, in 1911 in Hannover. Shewas involved in several premieres of contemporary operas: In 1904 she sang in Hamburg the title role in Siegfried Wagner’s "Der Kobold", in 1910 in Dusseldorf she appeared as Marga in "Stella maris" by A. Kaiser and on 23. 12. 1911 at the Berlin Kurfürstenoper she performed in ‘’I Gioielli della Madonna’’ of Ermanno Wolf-Ferrari (as Maliella). Her repertoire included Pamina in "Zauberflöte", Elisabeth in ‘’Tannhäuser’’, Elsa in ‘’Lohengrin’’, Sieglinde in "Walküre", Gutrune in "Götterdämmerung", Cio-Cio-San in ‘’Madama Butterfly’’, Marguerite in ‘’Faust’’, Martha in "Tiefland" of E. d'Albert and Blanchefleur in "Der Kuhreigen" of Wilhelm Kienzl. Probably she passed away during the 1920’s in Hamburg.